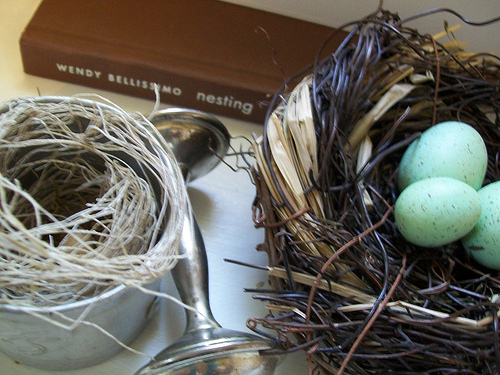 Few things are more special or can be more of a blessing than preparing for a new life to enter your home. Whether it is a large room or a small corner, a baby space is special and can bring so much joy to the one making preparations and using the space once baby arrives! There are so many decorating choices and ideas out there..it can be overwhelming! Do something emotional! Don’t fight it, embrace your excitement. When decorating 8 month old son Henry’s nursery I knew I wanted to keep much of the “bones” from his brother’s room: white furniture (though we did add a comfy rocker this time), linen colored walls (Laura Ashley Stone 2 from Lowe’s), and white scalloped awnings. 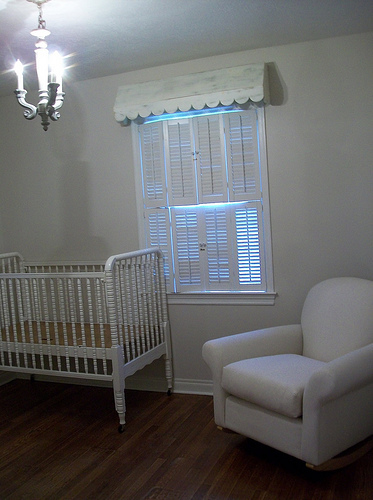 My theory is that when using non-juvenile fabrics like I chose, elements like the scalloped awnings lend a subtle baby feel so the room doesn’s seem too grown up. Big brother’s nursery was more vintage and red (click here and scroll to last page for a peek of Drew’s baby room in the June 2005 issue of Better Homes & Garden)..I wanted Henry’s room to have softer colors with a touch of a modern feel. New fabrics and a few handmade items were all the room needed to totally change the look! The fabrics in Henry’s nursery were a great bargain and came from fabric.com (Waverly trellis on drapes and stripe on bumper, actually indoor outdoor fabrics which wash up softer than you might think) and the organic leafy accent fabric is Dahlia from Calico Corner as is the linen dot on the crib skirt. I made the drapes and placed them inside the awnings with a shower rod! I had the bedding made locally. If you are doing any of your own painting or sewing, plan on doing it early before your baby bump begins to get in the way! And here is my point about the emotional element, it’s my belief you don’t have to be practical about every choice in a nursery. YOU ARE HAVING A BABY, it is a MIRACLE and very exciting. Sure it is great to reuse cribs and other items so that the room can grow with the child and save money but I think it is okay to have one item or more that are just for the baby phase and pure visual bliss..whether it is a fabric (face it, little boys grow out of toile fast!) or a special print or painting, it is okay. As the mama, you will spend HOURS in this room. A beautiful, well thought out atmosphere will bless you in the wee hours and on days when you don’t get a shower. It is worth the effort. And as the saying goes, they are only a baby once and you can save the item as a keepsake or pass on to another baby. For me, that item was the dahlia fabric. I knew Henry would outgrow that look fast but I wanted a fresh modern baby fabric in the mix so I just made one pillow and one side of the baby comforter out of that fabric. When he is one year or so I will remove those items from the room..use the pillow in a guest room and frankly the comforter is getting pretty worn anyway because I use it for his tummy time on the floor and have washed often. It will make a great picnic blanket. The blue trellis drapes also will not last a little boy forever but I am thinking they might look great in my dining room down the road. For now they have created a sophisticated and soothing nursery for both of us to enjoy. We can always add the cowboys later! My five year old recently told me he wants a “sportsy room” …”you know with a basketball net and trophies”..so I rest my case, embrace the baby phase and your ability to make all of the decisions for their room as long as possible..Enjoy mamas! I love everything about Henry’s nursery! Where did you purchase (or how did you make) the scalloped awnings? Love them. I originally purchased the inspiration for these awnings at Round Top when i was pregnant with Drew in 2004…..they were vintage from an old house..they liked ONE inch fitting..so i had my cabinet maker guy copy them using the originals as a pattern and he did an amazing job..his wife did the shabby white finish and i love it..i sold the original awnings on my old website..,i think they are hanging in a little girl’s room in Florida! You are the Mama Mia of design!! What great ideas! Pretty upholstery but changeable!!!! Well done! That fabric is great. I love the flowers and the colors. I could use that in my “41-year-old” room! May I ask where you go the two pictures hanging above Drew’s crib. 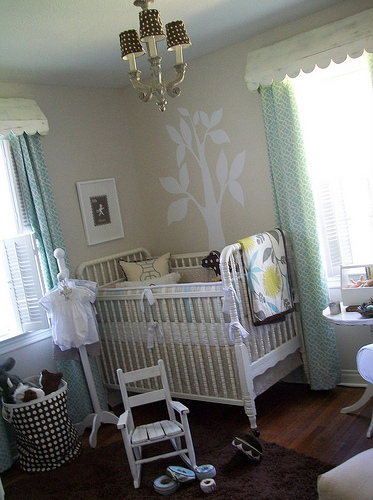 I am expecting a baby in 4 weeks and have decorated my son, Hutson’s room much like you decorated Drew’s. The only thing left is something above is crib–when I saw the pics. of Drew’s room, I knew I had found what was missing! Any information would be greatly appreciated! Amen! Great post! Ever since I first saw those awnings, I thought they were genius. And, Holly! I vividly remember that layout in BHG…did NOT know that was yours! As I was looking through it, I was floored. Too funny! I even have that kitchen pic in my inspiration files (loved the light fixture, and what looks like a wood prep area by the stove???? ), and I remember someone somewhere trying to recreate the living room wall. I don’t remember where I saw that, though. SO, so, so wild… :o) I guess I’ve been a fan of yours longer than even I knew.. haha! Hey Holly, I am in the midst of beginning a nursery for my first. We are not finding out what we’re having so I’m going to use grey, white, and yellow as my colors with some pops of blue and fuschia. 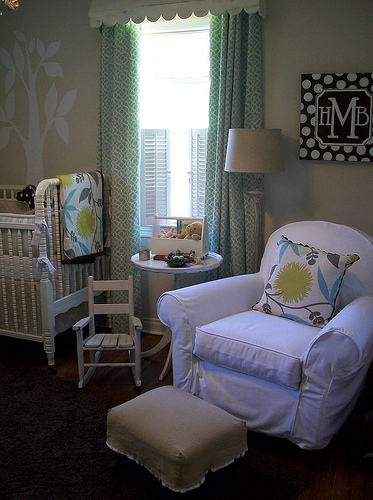 Anyway, my question is about the big white chair in Henry’s nursery. Is it a glider? Where did you find it? I cannot find a white glider anywhere except for PB Kids and those run around $700. Just figured I would ask! Adorable!! !Just like you!!!! !And fun!!!!!!! !Keep up the good design! I love that rocking chair. I’ve been looking for one like that for months and I’ve never found anything like it! Where did you find it? Do you think you could take a regular arm chair like that and add rockers to the bottom of it? Also wondering where you got that lovely rocker — I can’t stomach the look of the gliders… (ick)…and that chair is exactly what I’ve been looking for! Absolutely love the nursey and the modern touches!! Was wondering where you found your crib and glider? In love with both…. Any info would be greatly appreciated. Thanks again for sharing your blog! !